The steeps — for expert skiers, the anticipation of the drop elicits thrills. But beginner skiers at the top of their first steep slope often succumb to fear. Peering down is scary. 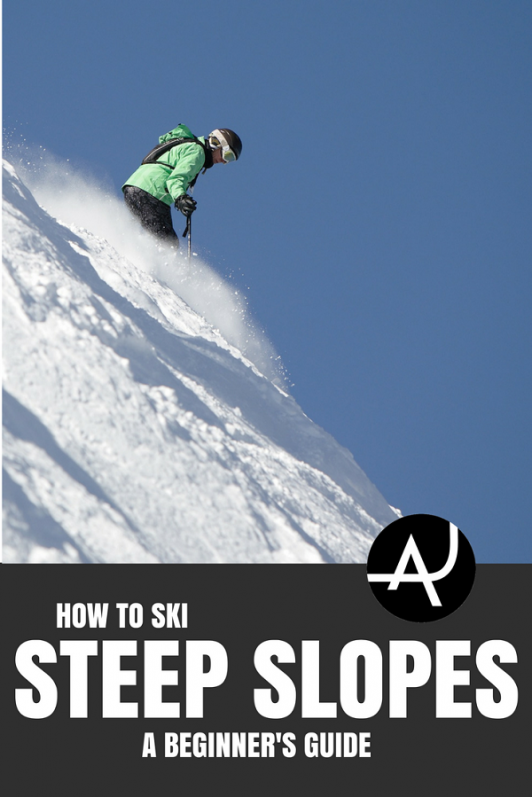 So, check out our beginner’s guide for how to ski steep slopes for essential steps for success. 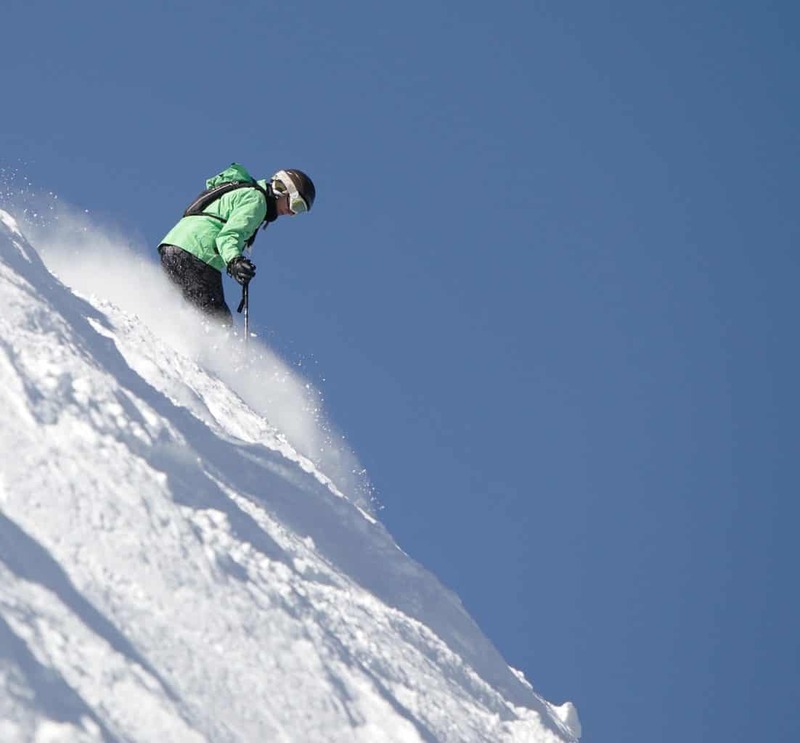 Our aim at The Adventure Junkies is to help you begin explore the steeper slopes at ski resorts. With the steps in your head and practice, you’ll be able to explore more terrain. Steep slopes no longer need to be intimidating. You can tackle them with confidence and revel in the adrenaline rush that comes with them. Balance and body position are key for skiing steep slopes. Starting from the feet and going up the body, let’s look at how you should stack up your body parts for the correct posture. 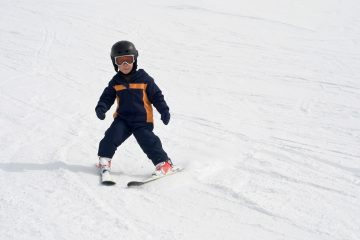 For skiing the steeps, it’s no different than when you first learned to turn on skis. Fear causes many skiers to sit back on steep slopes. Weight goes to the heels, almost in a classic cartoon skid. But that’s the exact opposite of an aggressive stance needed to ski steep slopes. Weight needs to be balanced over the feet, with equal distribution between the balls and the heels. Feet should be centered below the hips and shoulders. Fear also causes the knees to lock in a stiff stance. However, the knees must remain loosely flexed for mobility in skiing steep slopes. Push the hips forward. On steep slopes, it seems like sitting back would be safer, but it’s not. Stacking the hips into balance over the balls of the feet lets you ride the skis and control their direction. Focus your eyes and upper body down the slope. The lower body should do the work of the turns, but the upper body should remain in a stable position. Bouncing around and upper body flailing throws off balance. The upper body should be perpendicular to the slope and tilted slightly down the hill, rather than up the hill into the slope. To ski steep slopes requires that the hands stay in front of the body. Do not let them stray to your hips or worse yet, behind your hips. When the hands move back, so does the fanny, which throws balance out of whack. If the hands stay in front, you’ll maintain a more successful body position. In fact, look for your hands in the periphery of your vision. If you can see them, then they are in a good location. Keep the head up rather than looking at your feet. Look down the slope aiming for where you want to go rather than the few inches in front of your skis. Keeping the head up promotes better balance. A balanced posture is critical to your success. Maintaining a correctly stacked posture is primarily the job of the skeleton. Getting out of a stacked posture resorts to muscle support for skiing, and muscles tire quickly. Bones don’t tire, so rely on the skeleton for support. Before launching on steep slopes, plan to master several skills on easier intermediate groomed runs. Once you can execute these maneuvers, only then is it time to notch up the pitch of the terrain. To make parallel turns work more efficiently and broadly across varied terrain, skiers add more dynamic action. You can recognize dynamic parallel turns by the up-down movement. Hips, knees, and ankles flex more, and between turns, bodies extend more in shifting weight. Dynamic parallel turns also have rhythm. Pole plants help with establishing the rhythm for turning. Carving turns is skiing on edges. If you look up a slope where a skier has carved turns, you’ll see thin “S” shaped lines in the snow from the ski edges. Carved turns go from edge to edge with little to no time spent on the flat part of the ski. Carved turns require force to be put on the edges. That means flexing the hips, knees, and ankles. 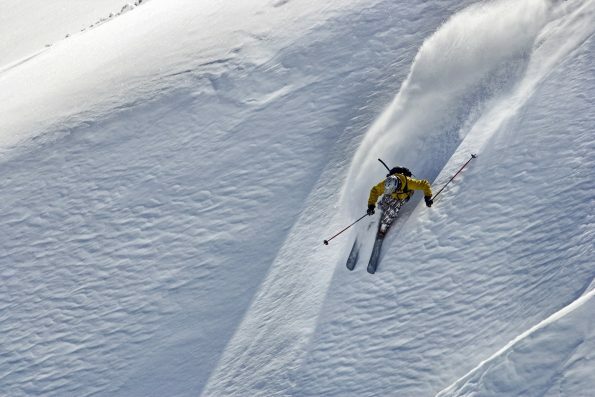 Applying the force causes the ski to flex, which makes it carve through the snow. Various skis carve differently, based on the shape of the ski. The length and amount of sidecut affect turning. Most skiers learn to make medium or large radius turns first, but you’ll need to do more than making big swooping arcs down steeper slopes. When runs pinch narrow or contain trees, you’ll need to pull short radius turns out of your arsenal. Short radius turns are faster and quicker. After pressuring your skis in one turn, release them quickly to start the next turn. In large radius turns, skiers sink into the skis, toying with the speed of the fall line. The quicker short radius turn cuts into the snow for speed control and immediately leaps to the opposite turn. Rather than lingering to gain speed, these turns use quick movements from edge to edge instead. The turn uses all the same moves, only condensed into half the time or less than it takes to do a medium or long radius turn. With skis parallel, a hockey stop digs the edges into the snow to stop. It gets its name from the quick stops hockey players execute on the ice. With the upper body focused downhill, turn the skis together sideways into a downhill slide, and then pressure the skis under the boots to weight the edges. It is a controlled maneuver, not a way to correct out-of-control, high-speed descent. When you are unable to turn but need to change directions on a steep slope, the kick turn comes into play. With skis sideways to the slopes, place both poles on the uphill side to aid with balance. Lift the downhill ski forward, picking up the toe and heel, to reverse its direction. Your boots will point uncomfortably in two different directions, as will your parallel skis, similar to a ballet plié. 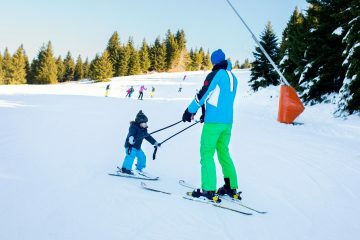 Shift body weight to the downhill ski and swing the uphill ski around to place it parallel to and facing the same direction as the other ski. It will now be the new downhill ski. 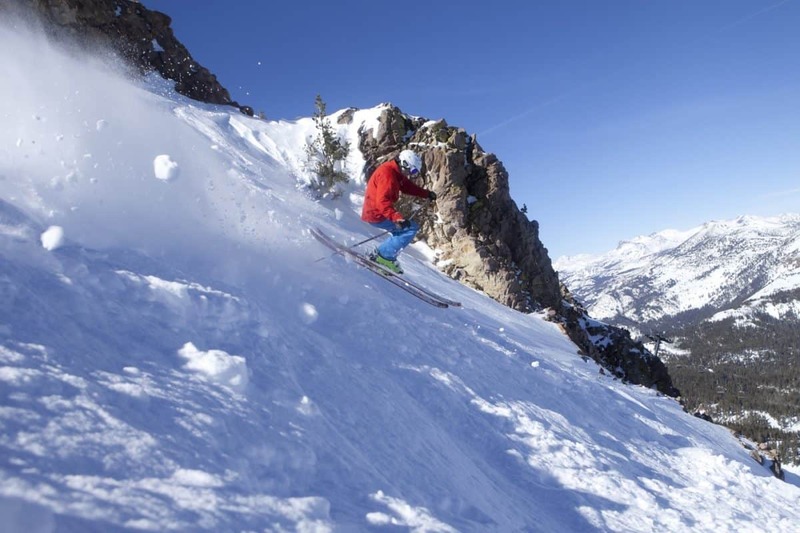 While we all love a thrill, you’ll have more success skiing steep slopes if you move up gradually in steep pitches. Don’t start by daring yourself to launch into the gnarliest double black diamond chute on the hill. Instead, lead up to more challenging pitches with practice on less steep terrain. Use a graduated approach, and leave those tight chutes for last. If you nearly hurl your stomach contents at the top of a groomed blue intermediate run, then you aren’t ready to go steeper. Practice makes perfect, and you can gain the confidence you need by skiing runs in your comfort zone over and over. Except for ski runs that have every terrain feature bulldozed out of them, most runs vary in pitch from top to bottom. Instead of skiing the less steep center of the run, go for the edge or steeper rollovers to build confidence. Be sure you can ski the steepest intermediate groomed runs on the mountain before taking the leap to black diamonds or off piste. Once you have the confidence to tackle all blue groomed runs on the mountain, then you are ready to move on to steeper ungroomed black diamonds and off-piste terrain. This is when the terrain choices expand to skiing glades, open bowls, and chutes. Leave the steeps with tight trees and narrow chutes until last. In learning to ski steep slopes, several skills will help. Experiment with the following techniques on gentler slopes before transferring them to steeper runs. Leaning downhill goes against all common sense. Yet in skiing the steeps, that’s exactly what you want to do. Fight all urges to lean back into the hill, and move the hips and upper body forward. Regardless of where your skis may be headed, face your upper body and head downhill. For descending steep slopes, plant your pole downhill to initiate turns. That reaching downhill rather than to the side helps position your body correctly. Expert skiers carry a variety of pole plants in their arsenal for steeps. Techniques such as the blocking pole plant versus a quick tap can aid in altering the speed of the turn. In narrow steep chutes, you may need to execute a hop or jump turn. It requires an exaggerated extension at the top of the turn to pick the skis up off the snow. The turn is accomplished in the air. The landing uses flexed knees. Pole plants are an essential part of the hop turn. On steep slopes, control your speed through different means based on the needs at hand. Use the bottom of the turn to dump speed by traversing further across the hill or even heading slightly uphill. Carving turns will speed up the ski, but skidding turns will slow them down; a little skidding, like the prelude to a hockey stop, can slow down a turn by using less edging. If you need to drop speed suddenly to avoid another skier, for instance, use a controlled hockey stop followed by a release. Savvy experts often read the terrain for places to control speed. A short rise in a slope provides a good place to shirk off some speed. Rather than tucking into the compression before the rise, ski up the rise and bank slowly off of it. On a rollover, instead of skiing straight over it down the fall line, carve a turn across it to lessen speed. Learning to read the terrain will help you find many ways to help you manage control of your speed. Enjoy the adrenaline, but keep the speed under control. Turn shape can aid in skiing steeps. Rounded carved turns can be adjusted to slow down or speed up. The longer you pressure the working ski at the end of the turn, the more the ski will slow down. If the skis are turned uphill a little before starting the next turn, they will slow down, too. Conversely, swapping quickly at the finish of the turn into the start of the next turn will speed up the skis. Broad radius, giant slalom-style turns work on steep, wide slopes. On narrower steep slopes, short radius turns do the trick of descending within the confines of the run edges. On ultra steep, narrow slopes, such as chutes, employing quick, pivoting side slips work better instead of rounded turns. This type of turn keeps the speed slow and the turns within the narrow confines of the chute. Rather than attempting to conquer the steeps via trial and error, which could end with an emergency room visit, hire a professional instructor. Many ski resorts offer lessons in steep skiing techniques. 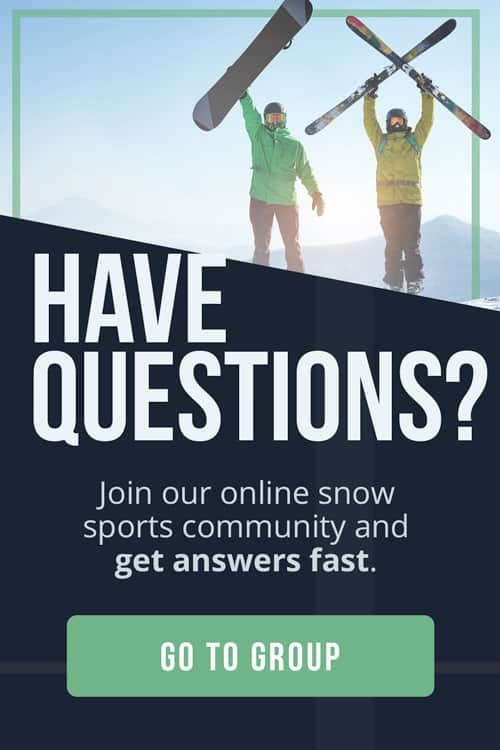 You can take one group or private lesson to gain an introduction to the steeps, but you’ll progress further and faster with multi-day programs or ski weeks that solidify techniques. 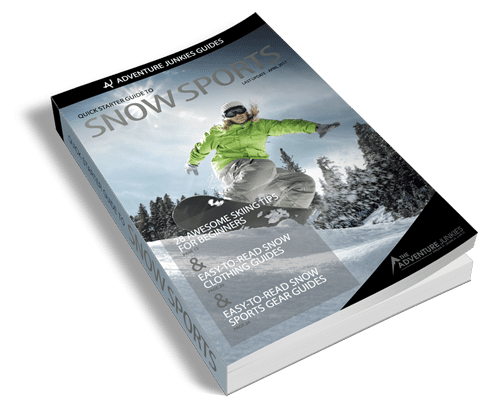 Look for ski instructors in North America certified through the Professional Ski Instructors of America (PSIA) or Canadian Ski Instructors’ Alliance (CSIA).